Use this Polar Tech 28 oz. 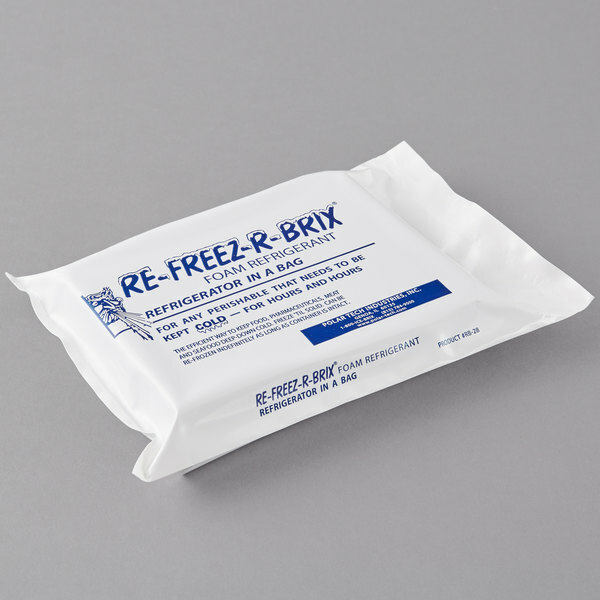 refreezable foam freeze pack to keep perishables at food-safe temperatures! 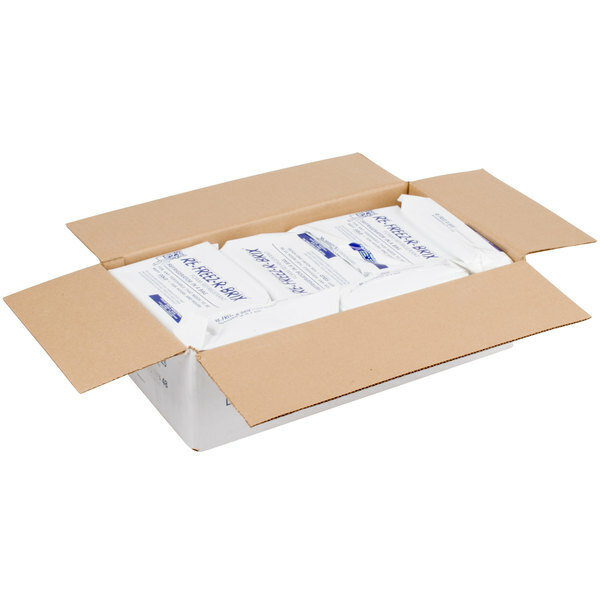 Made of rigid foam, this freeze pack can keep food requiring a temperature of 32 degrees Fahrenheit to 60 degrees Fahrenheit at a safe, uniform cool temperature. It retains its shape through the freeze and thaw process, and comes sealed in a heavy plastic pouch for longevity. This ice pack is easier and cleaner than ice, effectively chilling food without the mess caused by melting ice. Not only does this versatile pack keep your foods cool, but it can also be used to prevent perishables from freezing when packaged in properly insulated containers. Due to its thin shape, this pack fits easily on top of or below products where space is limited. Made with non-toxic refrigerants, this pack works well in virtually any application where you use ice to chill food and beverages. Use it in insulated shippers, pan carriers, and countertop condiment holders to keep items cold. The foam freeze pack is excellent to have for cold lunches. It doesn't take up much space in the freezer or lunch box. I am very happy with my purchase as this product is a great value. Boy, these things are handy! We've used them to transport cold goods from the grocery store to home, and we also keep some on hand for our customers who may need to keep food items cold for their trip home. They stay frozen for plenty of time in a cooler, and they refreeze quickly. If you're really creative, you can even shape them to maximize cooler space! Great ice pack. They stay cold for hours, doesnt take long to freeze, and they keep my items cold. The size makes it easy to cool any size item. The Polar Tech 28 oz. Foam Freeze Pack fits perfectly in my husbands lunch box. It works great, keeps everything cold. I would definitely purchase again and recommend. I'm really glad I bought this freeze pack. It's just as good as the 15 oz size, though it does take a little longer to freeze. Excellent for the price. I suffered a knee injury earlier this month, and happened to have ordered this ice pack. I used it and noticed immediate benefits. The pack didn't condensate much either. Good small size for minor applications. The foam ice pack is a bit different than the traditional "gel" or water filled packs, but they seem to last longer and are more durable. We pack our coolers full of drinks / food and toss a few of these in to keep it cold for the long haul. 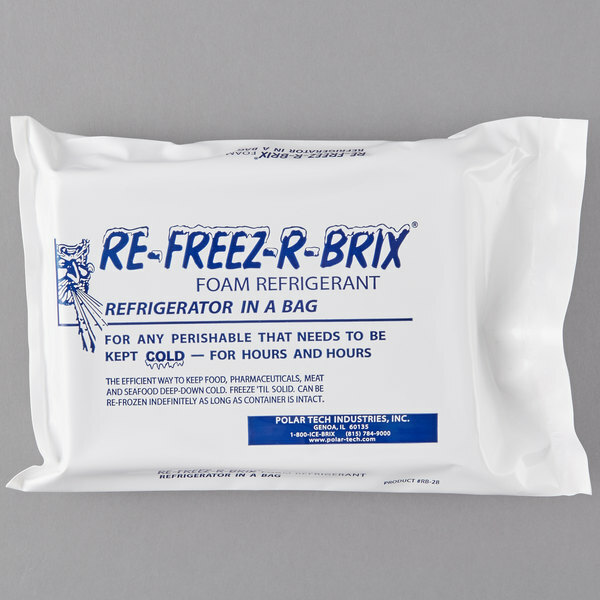 This is the Freez-R-Brix I use all the time in the coolers I bought. Each person is responsible to put what they want in their own cooler. If we are going to be at the beach or in the boat for a long time I use one on each side of the cooler and it keeps things cold all day, even in the bright sun. We won't do without them. These foam bricks are great. Forget about using ice block, Ice gel bags or ice cubes to keep your food chill. These freezing foam are keep my drink and cold food cold hours and hours in my ice chest. No mess, no ice melt anymore. 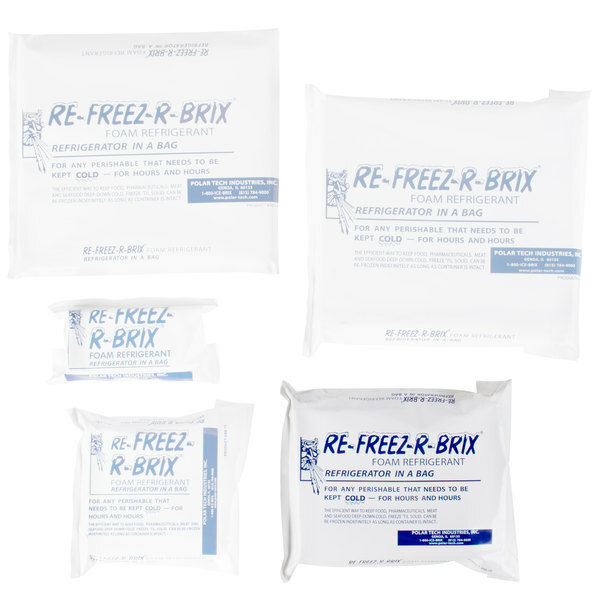 These work very well and they are a good size for packing in smaller coolers or containers. The only challenge is the shipping weight! It's going to be high! these work wonderfully! Stay cold very long and hold shape. They do start to leak, but its very easy place them inside a gallon six freeze zip lock bag. These are convenient and work well for keeping food cold. I like the fact that there is no possible leaking when dealing with water or other liquids. These Polar Tech Foam Freeze Pack work better than anything I have ever used!!! I throw them in my cooler back before shopping and they keep things very cold until I get home after a day of shopping, eating out and errands. 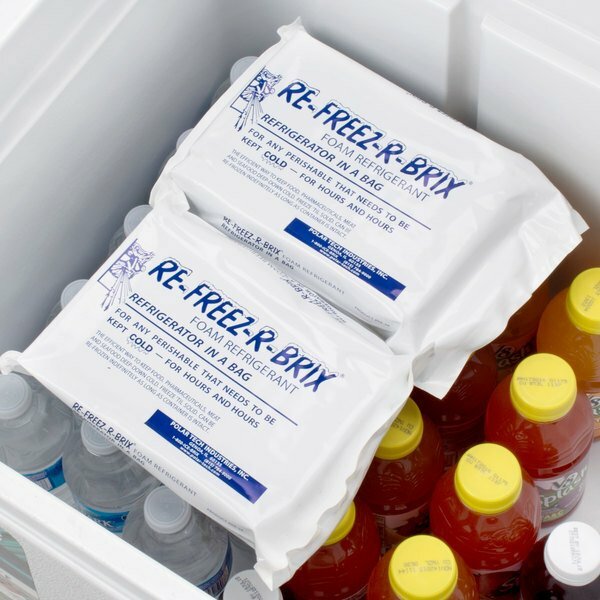 These foam freeze packs keep food cold for a remarkably long time. I'm very pleased with how well they work. It makes transporting cold products much easier (and safer).